Modern technologies have raised the process of document scanning to another level. 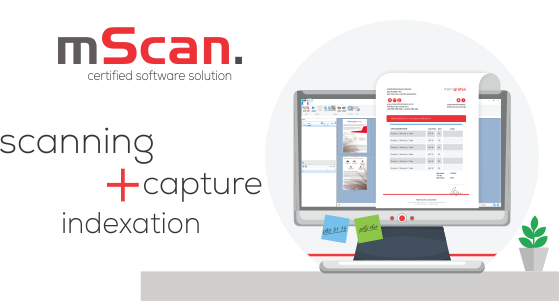 Mikrografija has developed a solution called mScan, a certified software for scanning and capturing documents, as well as for the recognition of various types of content. The mScan software enables users to immediately begin scanning documents, indexing and conducting character recognition. Not only is the e-document digitised following this method of maximum use, the scanned images can be additionally processed later on. As the mScan application supports full integration with the mDocs document management system and the mSef e-storage, it can additionally speed up and simplify working with documents, which can quickly be placed within the document management system or e-storage. option of exporting content to other systems and applications (e.g. certified mSafe e-storage, mDocs document management system, Alfresco, Dropbox etc.). In addition to recognising texts of forms and structured documents, mScan produces excellent results in text recognition in unstructured documents, which today make up around 90% of business correspondence. Digitisation of paper documents has never been simpler. Contact as if you are interested in mScan!